All hotels and transport are locally owned. We support the Mayan community at the Cockscomb sanctuary: a small community of Mayan ladies survive on the production of their traditional crafts. We also donate to and visit the Baboon Sanctuary an area designated for the protection of the howler monkeys. Where we use local providers for excursions such as lamanai and the snorkelling trips our local crew are trained in and brief on responsible tourism and the protection of the flora and fauna (coral reefs) in the area. 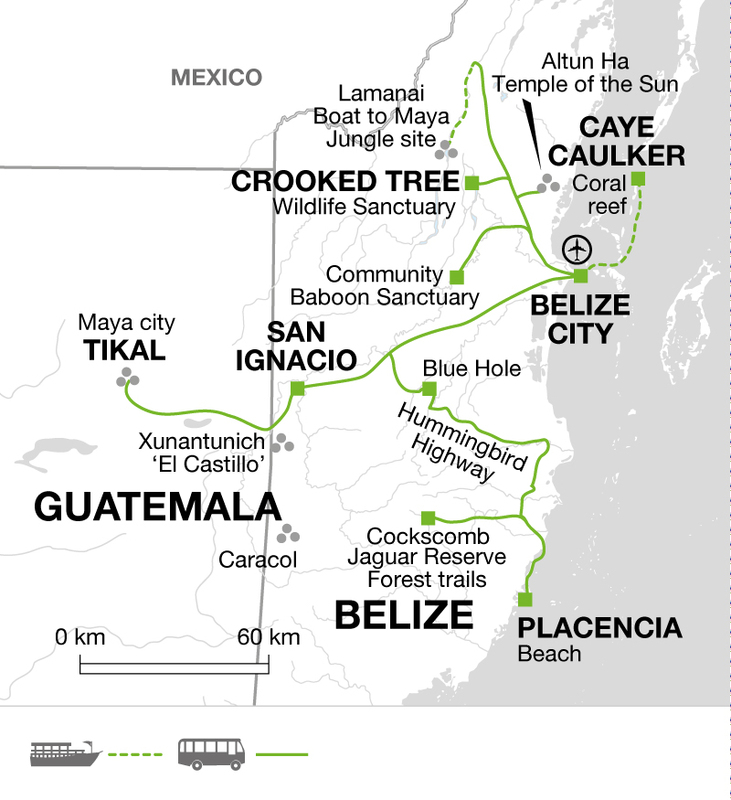 Belize is still largely untouristy on the mainland, and many of the communities survive off the tourism economy and are engaged with protecting their local environment, whether it be jungle, wetland or reef. At the Crooked Tree Wildlife Reserve you will visit the Belize Audobon Society's ranger station, which does a lot of work into educating the young people in the area in wildlife protection. My first sight of a Maya temple through the jungle, watching a whole family of coatimundis cross the path at Tikal, & swimming with a spotted eagle ray. Yes. We stayed in locally owned hotels, ate in locally owned restaurants and used ( and tipped) local guides at all sites and snorkeling trips. We minimised our plastic waste and were careful not to damage the reefs where we snorkeled. We visited several reserves and conservation projects which were supported by our entry fees. Great. Chris was an excellent group leader - his local knowledge gave us a real insight into Belize - it's people, history and wildlife. I went hoping for Maya sites, jungle wildlife and snorkelling. All were superb.